Israel Zangwill and G. K. Chesterton: Were they friends? September 9, 2013 4:45 pm / 4 Comments on Israel Zangwill and G. K. Chesterton: Were they friends? In a previous report I examined the resilient myth that the Wiener Library defends G. K. Chesterton from the charge of antisemitism. In this posting I raise a more complex question: what was the relationship that existed between the prominent Anglo-Jewish author, Israel Zangwill, and G. K. Chesterton? 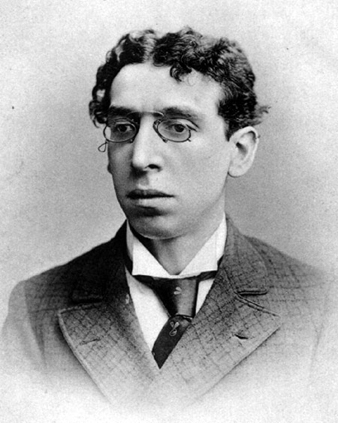 Michael Coren stated in 1989 that Israel Zangwill was a friend of Chesterton, describing them as a “noted literary combination of the time.” Joseph Pearce has likewise reported that Israel Zangwill was someone with whom Chesterton had “remained good friends from the early years of the century until Zangwill’s death in 1926.” One of the pieces of evidence of a friendship, circumstantial at best, is a photograph of Chesterton and Zangwill walking side by side after leaving a parliamentary select committee about the censorship of stage plays on 24 September 1909. The photograph was originally used for the front cover of the Daily Mirror on 25 September 1909. As they were both prominent authors, it is hardly shocking that they would both attend and give evidence at such a gathering. The photograph probably demonstrates little beyond that they shared an interest in government censorship and that they left the meeting at the same time (there is simply no way to tell for sure). 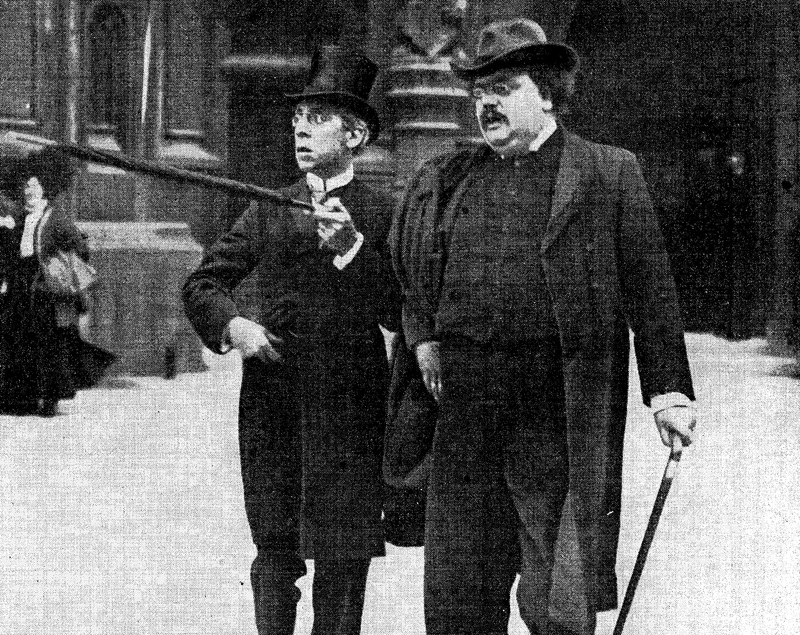 According to an entire issue of Gilbert Magazine (2008) that was dedicated to defending Chesterton from the charge of antisemitism, Zangwill and Chesterton “had respect and admiration for one another.” The photograph of them leaving the select committee on censorship was used as the front cover of the issue of Gilbert Magazine. It has also been used in a number of other books and periodicals about Chesterton. Prior to 1915, Chesterton had on occasion referred to Zangwill in positive terms, describing him as a “great Jew,” “a very earnest thinker,” and the “nobler sort of Jew.” Likewise, Zangwill wrote a letter in 1914 and another in January 1915 which together suggest that an amicable relationship may have existed for a time (possibly until 1916). In 1914, he wrote to apologise for not being able to attend a public debate with Chesterton and several other people about the veracity of miracles. The letter was friendly though somewhat equivocal in its expressed sympathy for Chesterton’s play. On 25 November 1914, Chesterton was overcome by dizziness whilst presenting to students at Oxford. Later that day he collapsed at home. He was critically ill, and it was feared that he might not survive. Whilst he did not fully recover until Easter, his wife reported on 18 January 1915 that he was showing some signs of recovery. On 19 January, Israel Zangwill wrote a letter to Frances Chesterton, in which he expressed his pleasure at hearing that her husband was on the mend. Whilst these letters and articles do not disprove the argument that Zangwill and Chesterton had an amicable relationship, at least for a time, they do suggest that Zangwill did not believe that Chesterton was guiltless of antisemitism. If Zangwill considered Chesterton a friend after 1915, let alone a pro-Jewish friend, he had a strange way of showing it. At the very least they problematize the argument that Chesterton could not have been antisemitic on the grounds that Zangwill was his friend, as from 1916 onwards Zangwill clearly came to perceive and describe Chesterton as an antisemite. I would love to hear from anyone that has found any other evidence of a friendship or enmity between Zangwill and Chesterton (please click here to contact me). Michael Coren, Gilbert: The Man Who was G. K. Chesterton (London: Jonathan Cape, 1989), p.209. Joseph Pearce, Wisdom and Innocence: A Life of G. K. Chesterton (London: Hodder and Stoughton, 1996), p.446. Sean P. Dailey, “Tremendous Trifles,” Gilbert Magazine 12, no. 2&3 (November/December 2008), p.4. Gilbert Magazine is the periodical of the American Chesterton Society. Gilbert Magazine 12, no. 2&3 (November/December 2008), p.1 [front cover]. See G. K. Chesterton, Appreciations and Criticisms of the Works of Charles Dickens (London: J. M. Dent & Sons, 1911), xi; Letter from G. K. Chesterton to the Editor, Jewish Chronicle, 16 June 1911, p.39; G. K. Chesterton, Our Notebook, Illustrated London News, 28 February 1914, p.322. According to Zangwill, Chesterton was “putting back the clock of philosophy even while he [was] putting forward the clock of drama. My satisfaction with the success of his play would thus be marred were it not that people enjoy it without understanding what Mr. Chesterton is driving at.” The letter is cited in G. K. Chesterton, Joseph McCabe, Hilaire Belloc, et al., Do Miracles Happen? (London: Christian Commonwealth, ), p.23. The letter is also quoted by Joseph Pearce in Wisdom and Innocence: A Life of G. K. Chesterton (London: Hodder and Stoughton, 1996), p.205. See Joseph Pearce, Wisdom and Innocence: A Life of G. K. Chesterton (London: Hodder and Stoughton, 1996), pp.213-220 and Dudley Barker, G. K. Chesterton: A Biography (London: Constable, 1973), pp.226-230. Letter from Israel Zangwill to Frances Chesterton, 19 January 1915, ADD MS 73454, fol. 44, G. K. Chesterton Papers, British Library, London. G. K. Chesterton, “Mr. Zangwill on Patriotism,” At the Sign of the World’s End, New Witness, 18 October 1917, pp.586-587. Israel Zangwill, The War for the World (London: William Heinemann, 1916), p.58. Israel Zangwill, “The Jewish Bogey (July 1920),” in Maurice Simon, ed., Speeches, Articles and Letters of Israel Zangwill (London: Soncino Press, 1937), p.103. Letter from Israel Zangwill to the Editor, “Problems of Zionism,” Spectator, 26 February 1921, p.263. In this letter, he went on to state that the so-called Jewish problem does “not concern Mr. Belloc, and I would respectfully suggest to him to mind his own business.” See also “Mr. Zangwill and Zionism,” Jewish Guardian, 4 March 1921, p.1. In May 1922, Zangwill referred to Belloc on a couple of occasions whilst criticising a non-territorial “spiritual” Zionism. He stated in the Jewish Guardian that “what the victims of anti-Semitism (the unassorted or downtrodden of our race) require is not a spiritual Zion, which ‘is no more a solution of the Jewish problem than Mr. Belloc’s fantastic scheme of re-established ghettos,’ but a ‘solid, surveyable territory.’” See “The Degradation of Zionism,” Jewish Guardian, 12 May 1922, p.8. He made similar remarks in a letter to the editor of the Times newspaper on 8 May 1922. He also wrote twenty-five pages of unpublished notes and criticisms of Belloc’s book, The Jews (1922). G. K. Chesterton, “What shall we do with our Jews?”, New Witness, 24 July 1913, p.370 and G. K. Chesterton, The New Jerusalem (London: Thomas Nelson, ), p.227. G. K. Chesterton, The New Jerusalem (London: Thomas Nelson, ), p.227.